Security forces in Bahrain have arrested and beaten one of the country's leading human rights activists, his daughter says. 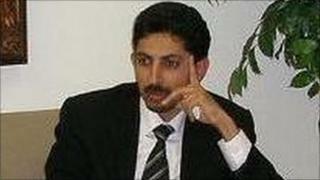 The activist, Abdulhadi al-Khawaja, was seized in the middle of the night and taken away with his two sons-in-law. It is the latest in a series of violent night-time arrests of opposition activists, say human rights workers. The Bahraini government accuses them of inciting unrest and trying to divide the Sunni and Shia Muslim communities. Mr al-Khawaja's daughter says in the very early hours of Saturday morning up to 20 armed and masked policemen broke down the door of their apartment and began attacking her father. Ms Khawaja says he offered no resistance but that the men beat him unconscious and dragged him downstairs, leaving a trail of blood. She said the family have no idea where he has been taken, what he is accused of, or how long he will be held. Abdulhadi al-Khawaja has long been a thorn in the government's side. To many, he is a respected human rights activist, to others he is a dangerous republican, a Shia who has called for the overthrow of the 200-year old Sunni monarchy. The government and its supporters have accused Iran and the militant Lebanese group Hezbollah of helping to stir up the unrest, in which nearly 30 people, mostly unarmed protesters, have been killed since February. Negotiations between the ruling family and opposition parties over political reform have stalled. The Crown Prince has blamed extremists for derailing the talks by setting up illegal roadblocks, accusing them of intimidating the population and trying to divide the country. Bahrain is now under emergency law with heavily armed troops visible on certain street junctions and over 1,500 Saudi and other Gulf state troops and police stationed. Opposition activists have called it an invasion but many Bahrainis, mostly but not exclusively Sunnis, have welcomed the deployment of troops as the country had appeared to be moving towards anarchy. Meanwhile, more than 400 people are believed to have been detained and hundreds more have been sacked from their jobs for taking part in pro-democracy protests. Daniel Williams, a senior researcher for Human Rights Watch who is currently in Bahrain, said arrests were taking place in people's homes almost every night here, with many detainees being held incommunicado. The government says there will be no leniency for those it calls extremists. But Human Rights Watch says there is no excuse for the arbitrary detention and physical abuse of the government's opponents.